Presidential candidate Newt Gingrich has promised us a permanent Moon base by 2020. Many people have been calling Newt's vow a publicity stunt, while others have chimed in by attacking the idea of a lunar base in and of itself, with assertions like "real scientists know [a Moon base] is fantasy." We won't speak to Newt's political maneuverings, but we're sure as hell not going to sit idly by while people bash the feasibility or scientific potential of a lunar settlement. In fact, we've got 185 reasons we should set a course straight away. NASA has expressed that all technologies developed for getting us to the Moon and keeping us there should, whenever possible, "be designed with maximum extensibility to Mars." Setting up a base on the Moon is in many ways one step removed from sending an astronaut to the Red Planet — and doing that puts us one step closer to us getting off this rock and out into our galaxy and beyond. One hundred, five-hundred, a thousand years from now, when our descendants look back on our first days of space travel, they'll remember that putting a permanent base on the Moon was the first, indispensable step. We spoke to astrophysicist Michael Shara — curator of the astrophysics department at the American Museum of Natural History — about the scientific potential of a permanent Moon base, and one of the first things to come up was lunar resource utilization. "Lunar geology is in its infancy," he explained. "Helium 3 and rare earth element mining would be a major industry." What is Helium-3? Remember the stuff they were mining in Duncan Jones' Moon? That was helium-3 — a non-radioactive isotope of helium with huge potential in nuclear fusion research and alternative energy applications. Yes it really exists, yes it really is rare on Earth, and yes it really could make a one-way-trip to the Moon totally worth it. 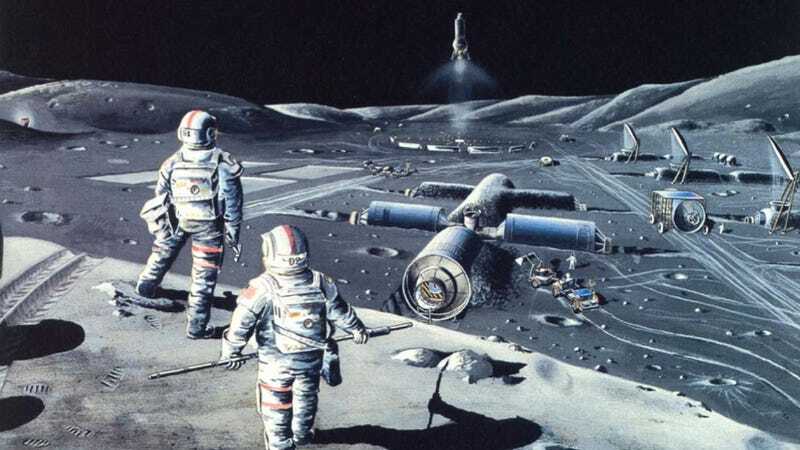 Not only would it make for a great off-world alternative energy source, it would also provide on-site support for expansion and development on the Moon itself. Have you heard about liquid mirror telescopes? They're elegant in their simplicity, economically affordable to construct, and harness incredible imaging potential. "It's so simple," explains Ermanno F. Borra, a physics professor at the Optics Laboratory of Laval University in Quebec, Canada. "Isaac Newton knew that any liquid, if put into a shallow container and set spinning, naturally assumes a parabolic shape-the same shape needed by a telescope mirror to bring starlight to a focus." And to top it off, the Moon's temperatures and open space make it the perfect place to build one. "Huge liquid mirror telescopes, operating in the ultraviolet and infrared range, would have 1000x the light-gathering power of Keck," Shara told io9. As a point of reference, the Keck Observatory's two main telescopes are the second-largest optical telescopes on Earth. Yes, getting back to the Moon will be expensive. Yes, setting up shop there permanently will be very expensive. But you have to think of it as an investment, because the potential for monetary return is huge. Think of the payback you'd see from space tourism, alone... then realize that every time a new resource is tapped, every time a new technology is developed, every time a new system is successfully demonstrated, it will be a boon for those who have contributed towards making Man's presence on the Moon a reality. Here, have 181 of them, from a list of Lunar Exploration Objectives published by NASA. Advancement of scientific knowledge, economic expansion, public engagement... it's all there. Going to the Moon is not a fantasy. It's an opportunity.